Zombies, including Juliet Green, of Lawrence, shamble across 8th and Massachusetts streets during the 10th annual Zombie Walk on Oct. 20, 2016. Thousands of zombies are expected to swarm downtown this evening as part of an event dubbed Hellaweenfest, which will include an attempt to set a zombie world record. The block of Seventh Street between Massachusetts and New Hampshire Street will be blocked off. A beer vendor, carnival games, face painters, food stands, haunted house and more will be available. The area will be free to enter. Gates open at 4 p.m. The zombie action will kick into high gear at 6 p.m. with an attempt to set a world record for zombies doing the “Thriller” dance. Organizers are asking all zombies who want to participate in the dance to show up at Seventh and Massachusetts Street at 6 p.m. to learn the dance moves. The world record attempt will begin at 7 p.m. 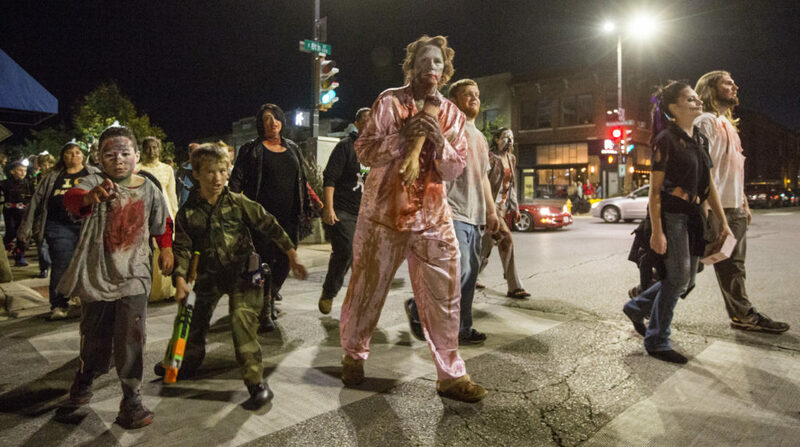 The actual Zombie Walk, which is the 11th annual, will begin at 7:05 p.m. at Seventh and Mass. About 10 p.m., Headquarters Counseling Center will show the classic “Rocky Horror Picture Show” on a big screen set up on Seventh Street. A more kid-friendly film is expected to be shown beforehand.